Minister Ricardo Miranda meets with X Games athletes at the future site of a 14-storey ski jump on the Calgary Stampede grounds. Calgary has secured exclusive rights to host the X Games. It would be the first time the event is in Canada. The X Games would bring more than 200 international skiing and snowboarding athletes to Alberta for a four-day action sports, music and art festival. The government has committed $13.5 million over the next three years to help bring the X Games to Calgary. Hosting the X Games would inject about $75 million into Alberta’s economy and support the equivalent of 540 jobs. The X Games is an annual action sport, music and art festival produced and broadcast by ESPN. The first X Games was held in 1995 in Newport, R.I. and Mount Snow, VT. The first Winter X Games was held in 1997 in Big Bear Lake, CA. The X Games are broadcast to an estimated 500 million households in more than 200 countries and territories. 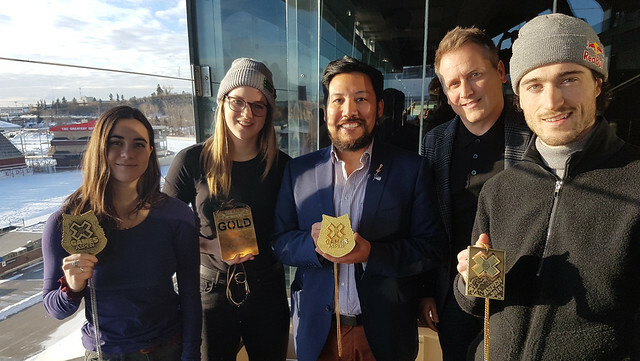 Hosting the X Games aligns with a key priority of the Government of Alberta – growing and diversifying the province’s tourism industry by boosting visitation in the winter season and increasing sport participation opportunities for all Albertans.